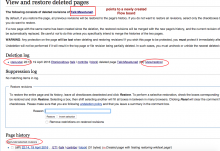 Undelete failed: No matching pages found in the deletion archive. After initial Error display(as in the ticket), all subsequent attempts to Restore such pages from e.g. http://ca.wikipedia.beta.wmflabs.org/w/index.php?title=Especial:Restaura&target=Discussi%C3%B3%3AET10 do not do anything. We probably don't want to allow people to undelete wikitext pages on top of Flow boards, but the error message should make more sense. 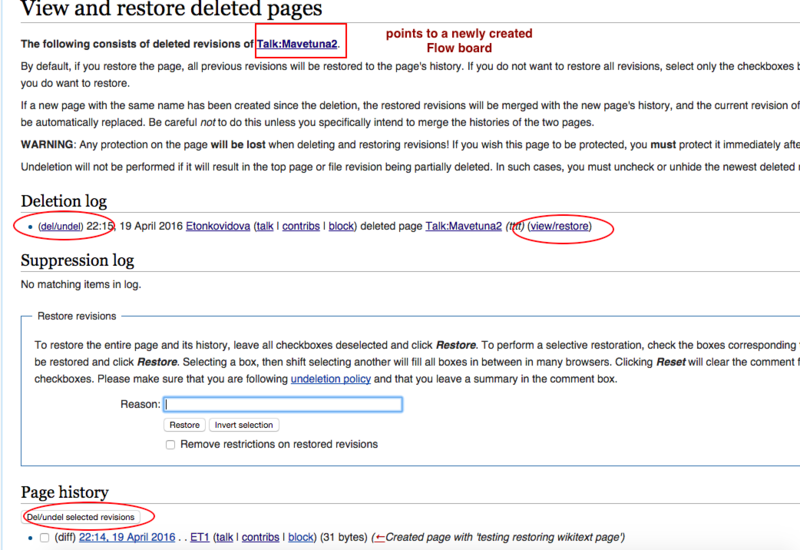 The issue is still happening - cannot restore wiki page after Flow page with the same name was created(via EnableFlow). try Undelete - the above error is displayed. It should work if you move the Flow board out of the way (without leaving a redirect) before the Special:Undelete step. Not tested, though. Specific cause is that it sees there's currently a Flow board there, so triggers onArticleDelete hook, so it expects the page ID being undeleted to be Flow, but it's not (the already-existent one was Flow, the undeleted page was not). But I agree with Roan we should probably just block this scenario. matthiasmullie moved this task from Ready for pickup to Needs Review on the Collaboration-Team-Archive-2015-2016 board. Checked the fix in betalabs - the error message is not present anymore. Instead, the proper warning is displayed: "The article couldn't be restored because there is currently a discussion board in place." The proper warning to users is in place. But to find it - it's little confusing. The below example uses Talk:Mavetuna2 page as an example. create wikitext Talk:Mavetuna2 and then delete it. Special:Undelete informs that "The following page has been deleted but is still in the archive and can be restored." The article couldn't be restored because there is currently a discussion board in place. Clicking on the link 'del/undel' link or on 'del/undel selected revision' button will display 'Delete/undelete revisions' page which has options only for changing the visibility of revisions. Most of the things she mentioned are areas for possible improvement. However, there is nothing wrong with "Talk:Mavetuna2 active link (to a new Flow board)" in my opinion. That is standard behavior for deleted pages where there is currently non-deleted content there (either due to a recreation or a partial deletion). Thanks Matt. Closing this now. @matthiasmullie and I think that this should be allowed (but handled properly), so rEFLWd569f06d016e: WIP: Use ArticleRevisionUndeleted instead of ArticleUndelete takes that approach. This works without error (and you can later delete the Flow board and restore the wikitext and that will also still work). The restriction put in place was also causing false positives.